Home Online Etihad Airways’ annoying communication mistakes – Don’t do them! January 28, 2013 Online, Social Media	Comments Off on Etihad Airways’ annoying communication mistakes – Don’t do them! Yesterday we published an article about managing a multilingual presence on twitter, and it was by sheer coincidence that I found an example of how NOT to do it! Earlier today I landed on the etihadairways.com homepage somehow one tweet led to another and before I knew it I was there. First of all what’s up with all the black? I know they’re trying to be luxurious and fancy but I think a re-design should be in the works! After all they’ve just celebrated ten years of being the National UAE carrier. But the design isn’t what I want to rant talk about. It’s actually their social media! On the homepage of the English site there’s a link to their Arabic Facebook page, fair enough, right? Not really! Because I didn’t realize it was their Arabic page until I spent a minute or two on it and saw that all the communication was in Arabic, surely they had to communicate in English with customers, after all they’re an airline which deals with a lot of tourists. Another thing that didn’t seem right was that the page only had +8K fans which I thought was low for an airline as big as Etihad Airways. So I went back to their website and in all fairness they had mentioned that the link was to their Arabic Facebook page, but why would they do that? Why would they link a customer from their English website to the Arabic Facebook page? Promoting a page to people that most probably have no clue what you’re talking about, is that the logic? I don’t know but I don’t see it as being effective. I ended up going back to Facebook and searching for Etihad Airways and got the official English page. The English Page had over 320K likes which made more sense. 1. There is no clear link between the pages, or any place that suggests for the English page (Or Arabic page) click here or whatever. 2. How are they planning to deal with questions in different languages? Do they reply to them in Arabic? Or do they tell customers to go check the English Facebook page? Below are two examples I’ve found on their Arabic Facebook Page while I was trying to find an answer. But surprise surprise, none have been answered and one of them is from January 19th. 3. The website homepage by default was in English for me, and the link for the Arabic website is so frustratingly hidden they, should’ve received an award for it. Even though in the back of my mind I knew that the link was going to be either on the left or the right top corner, it wasn’t clear. Can you find the link to change languages under 3 seconds? 4. Test on different browsers! I get an earful from clients every time something’s not working right on a specific browser (usually IE 6,7,8) and so for a big company like Etihad Airways to get it wrong is inexcusable. To explain what happened, I tried to change the location of the site, chose Saudi Arabia and checked the option to remember my preference. 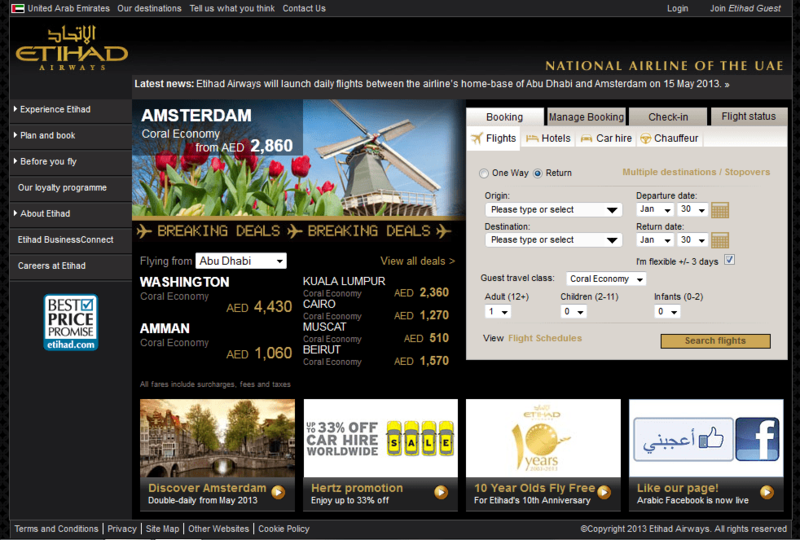 I then closed the tab, opened a new one and typed in etihadairways.com and it sent me back to the global site. Not impressed! I don’t mean to hate on Etihad Airways, if I wanted to I would’ve mentioned how lame their campaign to send a ten year old for free to a place of their liking, but I won’t do that! No, the main reason I wrote this article was because I think they can do much better and at the same time let people know what they should not do with their online presence. For more information about online and social media in the MENA region register to receive our newsletter or contact us to get a free consultation.